Gardeners are always looking for low care plants that will beat the heat, Origanum Kent Beauty is one of the best. A fascinating ground cover plant, Origanum Kent Beauty is a hybrid (Oreganum rotundifolium x scabrum). This is an ornamental trailing plant grown for the flowers and attractive foliage. The ability of Origanum Kent Beauty to grow well in soils that are on the dry side, as well as it love of a sunny potion make it a versatile plant for many situations. Its natural habit is to form a low mound that tends to trail gracefully. Flower color is described in many ways, this is because the more sun the plant receives the deeper colour the flowers will be. For us the flowers that appear from summer through to autumn appear as pale green/yellow to white bracts with a pink flush where they receive the most sun. When in full bloom the flowers resemble those of hops. Plant it along the top of a retaining wall and allow it to cascade over the edge. It grows well when used to underplant taller plants, in containers or simply mass planted as a ground cover plant. Excellent in a container in a sunny courtyard where the foliage can be allowed to cascade over the edge. 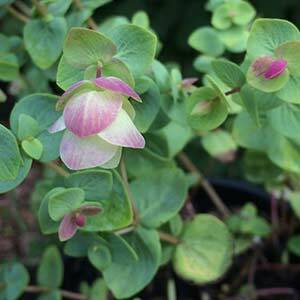 Origanum Kent Beauty is also suited to growing in hanging baskets and window boxes. Also uses as a cut flower as the flowers hold their colour well when picked. Position – Best in full sun, a little light afternoon shade in areas with very hot summers.